SPRING SALE 20% OFF! Amenities Galore! Family Paradise! Pools, Hot Tubs & More! Terrace at Pelican Beach Resort | 3 Bedrooms | Sleeps 8 | Family Friendly! Welcome to The Terrace at Pelican Beach Resort vacation rental 904 in Destin, Florida. The Terrace at Pelican Beach Resort vacation rental 904 in Destin, FL is a 3 Bedroom 2 Bathroom gulf view condo. Enjoy fashionable and well appointed accommodations during your stay complete with all the conveniences of home. Experience breathtaking views of the beach & gulf from your balcony daily; making it the perfect spot to call home during your beach vacation. The Terrace at Pelican Beach Resort, is a luxury high rise in the Heart of Destin. It is located on the same property as Pelican Beach Resort, directly across from the Big Kahuna Water Theme Park. The building is set back from the beach about 250 yards, but there is no street to cross. It is part of a great resort with fantastic amenities. The Terrace at Pelican Beach Resort Building enjoys all the fantastic amenities the building itself offers but also unencumbered access to all of the Pelican Beach Resort amenities. Pelican Beach Resort in Destin, Florida has long been a family favorite. Pelican Beach Resort is a direct beachfront resort boasting incredible amenities offering something for everyone including several gulf view pools, tiki hut serving fun tropical drinks beachside, indoor/outdoor pool and more. The resort is centrally located in Destin, Fl and near many family friendly activities. Come and see why families come back to Pelican Beach Resort year after year for their beach vacation. 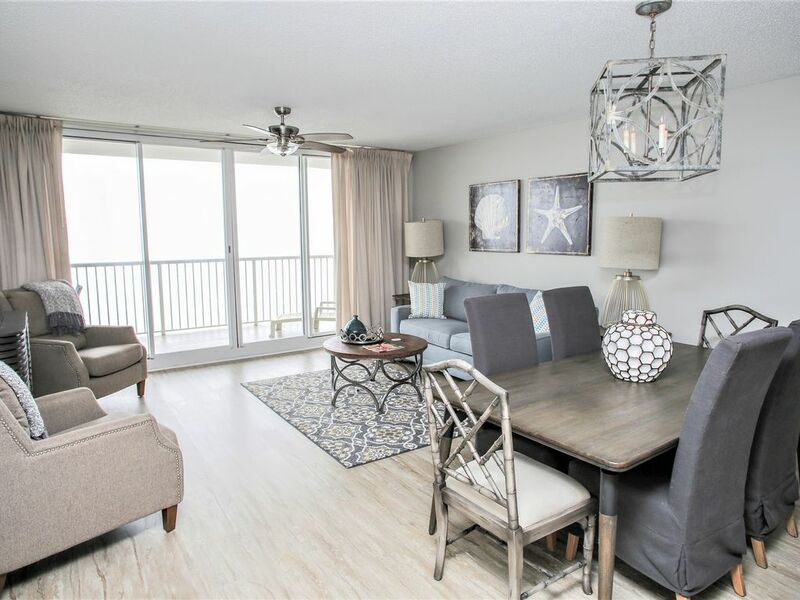 Terrace at Pelican Beach Resort enjoys a central Destin, Florida location makes the property a highly sought after destination along with its fantastic amenities with something for everyone. Terrace at Pelican Beach Resort is 200ft from Pelican Beach Resort Gulf Front. 300 yards to the beach! Perfect family vacation accommodations! (4) Flat screen in family room. TVs in each bedroom. Wonderful Views! Night views terrific, too - see the Destin harbor bridge lights! 3 pools throughout resort. Terrace has a dedicated heated pool, hot tub, community grill area and fitness center. All Terrace guests have access to ALL amenities at Pelican Beach Resort, too.